Hi everyone, first off let me apologize for the delay in posting new articles, now that my wedding planning is over I’ll be back to posting regularly. So for my first post back, I’m starting with one for the men who are definitely at a disadvantage when it comes to shopping for clothing online since so many retailers cater primarily to women with men as an afterthought. To keep things easier, I’ll break it down by website. While this guide is dedicated to buying clothing/accessories, stay tuned for another one to follow with a different focus. East Dane: East Dane is Shopbop’s brother website, catering exclusively to men. Like Shopbop, East Dane combines shopping with fashion advice on how to wear all the new clothes you’re buying. Also like Shopbop, they offer a huge selection of designer clothes with a wide array of price ranges. Be sure to start at the sale section if you’re on a budget, you can get some amazing deals on high quality, designer clothes. I got my husband to do some shopping for our honeymoon on East Dane, and he liked how easy it was to find what he was looking for, and the prices in the sale section. He also liked the free international shipping and having the option to prepay tax/duty rather than being forced into it. I like the style that they offer; some of the items my husband got I think you would be hard-pressed to find in a department store. For my review and more information on Shopbop, click here. ASOS: Asos is pretty much the mecca for all things online shopping for women, and the same rings true for men. 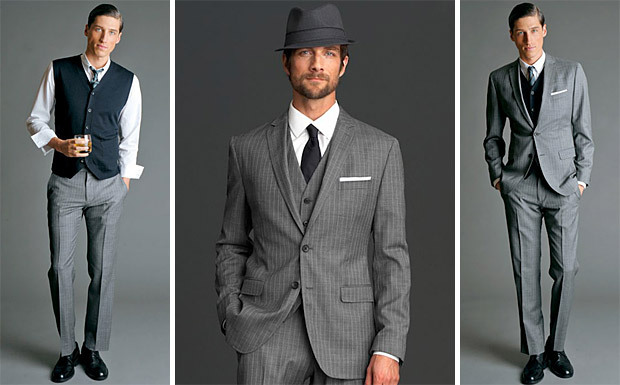 Fantastic prices on clothes, including suits, will make your wallet very happy. If you’re more of a hipster, this is also the place to go to find unique clothing (eg. crazy printed suits) to suit all your hipster needs. Asos also has tons of shoes and bags for men, so Asos can really be your one-stop shopping fix. If you’re worried about sizing issues, Asos has an amazing return policy so you can make sure everything fits to perfection. For my review and more information on Asos, click here. Club Monaco, Banana Republic, & J.Crew: Three great menswear stores that you can find at the mall, but they also have amazing deals online as well as a better selection of items. Both have an amazing lineup of suits, dress shirts, shoes; everything you need for work or for a nice dinner. Both have casual options available as well, but their real specialty is dress clothes. The best part about shopping online from these websites is the ability to return or exchange online purchases in-store, making the experience even easier. Mr Porter: The male counterpart of Net-A-Porter, is the place to go for all things high-end and designer. Mr Porter has positioned itself as a leader in bringing high-end, curated designer goods from all over the globe to eager menswear enthusiasts with great customer service to help you. If price isn’t an issue, this is definitely the place to be. From clothes to suits, to watches and even the new Google Glass, you can get it all, no matter where you’re located. Topman: The British classic, Topman, touched down on this side of the Atlantic in 2009 and almost instantly became a go-to for men looking for sharp cut suits that won’t empty a wallet. While the suits are definitely amazing, the entire range of casual clothing, shoes, and accessories are very current and on-trend, and won’t make you regret trying something new in your wardrobe. Topman happens to be one of my husband’s personal favourites for menswear, and while their own website is great, us Canadians can find a local selection from Hudson’s Bay. Uniqlo: The Asian fashion giant Uniqlo is a year-round one-stop shop for any stylish guy. The prices are already crazy affordable but the real steal though? Their cashmere sweaters. It’s a great place to stock up on basics like socks and underwear, plus every winter accessory you can think of. Their HeatTech line works wonders for brisk weather (you can check out my review of them here), and their new Ultra-Light Down collection offers packable, great-fitting outerwear for well under $100. Uniqlo offers extended sizes as well, catering to as many people as possible. Right now they’re also expanding their stores as well, now including Australia, so if they don’t ship to you now, just hold tight because they likely will soon. JackThreads: Jackthreads is a men’s online clothing store that sells products exclusively to members at discount prices. JackThreads is similar to gilt.com and MyHabit.com, selling its products at discount prices for a limited amount of time. The site has clothing and accessories directed solely for men, primarily casual clothing with a surf/street/skate style. Shoppers can sign up from Facebook, using an email account, or from a referral sent by a current member. Members are notified of a new daily sale which consists of a collection of 3-4 brands, in which they are sold at up an 80 % discount; these sales typically have a limited supply, last 72 hours, and rarely occur again, so be sure to snap up any items you love before they sell out. JackThreads also caters to us international shoppers, letting you prepay duty/tax and will refund you if the duty/tax ends up being less than you paid. I have a number of friends that love JackThreads, especially for nice watches at big discounts. Stay tuned for a more comprehensive review of them. This entry was posted in Basics, Website Reviews, Weekly Tips and tagged ASOS, Banana Republic, club monaco, east dane, fashion, J crew, jack threads, jackthreads, Mad Men, men, men's clothing, menswear, mr porter, online shopping, reviews, suits, topman, uniqlo. Thanks so much for your comment! You can now subscribe to RSS feeds through the sidebar on the right if you’re on a desktop, or at the bottom of the page for mobile devices.